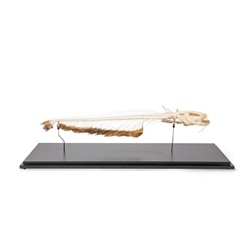 The African Catfish Skeleton Anatomy Model is an anatomy model from 3B Scientific and manufactured in Germany. This African catfish specimen comes mounted on a wooden base. The animal skeleton is perfect for ichthyology, comparative anatomy, and other studies.